If you are in the market for two tone weddings rings, you’ve probably already discovered that rings range from either mass-produced inexpensive designs to the exquisitely crafted handmade masterpieces. Regardless of what you can choose, once you start researching two tone wedding rings, you’ll start to discover that there are many critical considerations and few places where you can find the trusted information on these specialty wedding rings in one place. Buying a two tone wedding ring is not as simple as purchasing a simple wedding band. Take something as basic as your choice of precious white metal. Should you choose palladium, platinum, white gold or silver? If you want to contrast the white with yellow or rose gold, should it be 14K or 18K gold, and what are the advantages of each? Where and how is the wedding ring made, in a sweatshop in China or in an artisan studio with American jewelers? Is the precious metal in the two tone wedding rings ethical, or did it destroy an entire ecosystem? This article on two tone wedding rings will cover four general areas: Gender, Metal Choice, Fabrication and Ethics. Best of all, you’ll learn not only critical things to consider, but also insider information that many jewelers would not tell you because it goes against their financial interests. 1. What Distinguishes A Women’s Two Tone Wedding Ring From A Men’s? Here’s the quick answer to this question: if a woman wears a two tone wedding ring, then it is a woman’s ring. The same applies to a man. Your choice of your wedding ring is your choice alone. It is very subjective and the most important issue is what feels right to you. That said, what really distinguishes a men's two tone wedding band from a women's comes down to two issues: width of the wedding ring and style. Men’s hands are, more often than not, larger than women’s hands. Therefore, men generally choose wider wedding rings than women. Based upon my experience as a jeweler for over twenty years, mens wedding rings are generally between 5mm and 8mm. Most wedding rings for women have a width of between 2mm and 5mm. This smaller size is not just because of the generally smaller size of women’s hands compared to men’s. It also has to do with the preference of many women to wear their two tone wedding ring with their two tone engagement rings, known as bridal ring sets. Generally speaking, most women are comfortable wearing their wedding rings and two tone engagement rings with a combined width of under 8mm. The actual width of a two tone wedding ring is one of the determining factors in style—which brings us to the second gender matter. The style of a two tone wedding ring is obviously a highly personal choice, but it can be helpful to have a bit of historical perspective. The first recorded wedding rings were exchanged in Egypt, about 6000 years ago. They were made of braided hemp. Ancient scrolls recently deciphered indicate that, during the nine plagues, couples cut off their bands and smoked them—just to relieve a little stress. (Just kidding). Seriously, though—even back then, wedding rings were a sign of commitment between two people, and also the community that witnessed the exchange. The styles of their rings were a reflection of the culture and the times. These days, two tone wedding bands are both deeply personal and public because they represent a vow to one’s partner witnessed by the broader community. There are an infinite number of men’s and women’s two tone wedding rings styles, but we can break these into two broad classifications for simplicity: classic and designer. the metal, depending upon your preference. For some couples, the choice for a two tone wedding ring simple: a variation of a classic band. 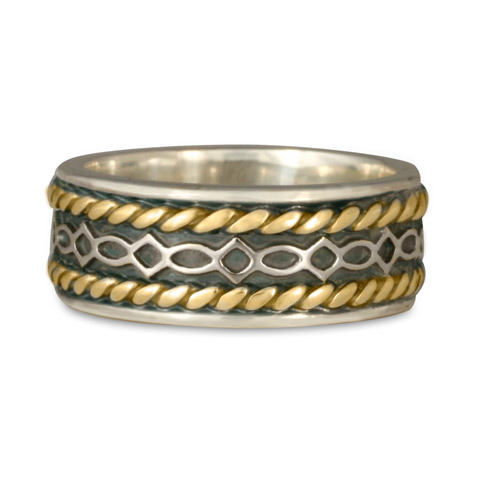 These bands stylistically lean toward the traditional wedding band, without design on the surface of the ring. They are variations of a timeless style which most likely your parents, grandparents, and even your great grandparents wore. 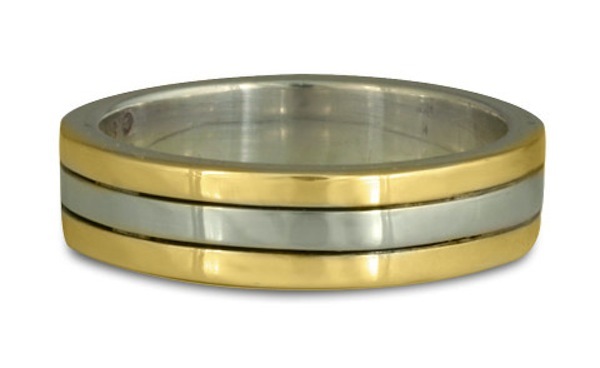 Within this traditional style, a two tone wedding ring can be made with the metal flat topped or dome topped. In our company, because we make these rings in house by hand, we can alter the width. The top surface of the ring can be squared off or rounded at the edges. Regardless of what classic two tone wedding ring style is chosen, it will be an minimalist yet elegant representation of your loving commitment. This two tone wedding band (our Flores Wedding Ring with diamonds) was handmade in our studio in Santa Fe, New Mexico. If are open to a two tone wedding ring that has more unique designer elements, then the actual wedding bands surface becomes a canvas upon which jewelers can create intriguing design motifs. The wider the band, the more room for design or pattern. Perhaps you and your partner are entranced by the beauty and wonder of the night sky. Then, perhaps, the two tone wedding ring inspired by Van Gogh’s masterpiece, the starry night might be the perfect choice. This series offers an array of variation of the design. 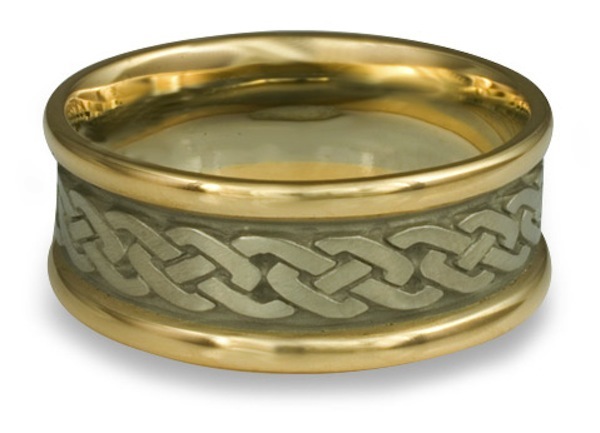 Another idea: a two tone wedding ring can actually represent some essential talismanic quality in a relationship, while at the same time remind one of their cultural connections. 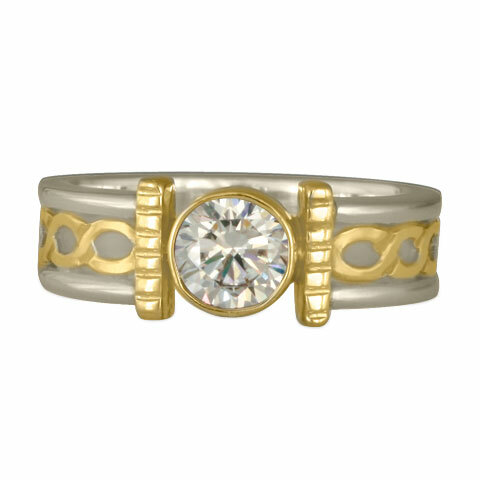 The lines in the narrow two tone arches wedding ring represent two paths weaving together. The knotwork on this Celtic wedding ring pattern illustrates a dynamic creativity that reaches up toward the heavens, and then down to the Earth. You can also choose to have a more pictorial motif, such this two tone wedding ring design featuring a flower motif. You choice comes down to what is more important to you among various factors among width, style and design. There are no fixed or absolute rules. If you see something that you like but isn’t quite right and you are working with a custom jeweler that specializes in two tone wedding bands, then it is often possible to vary the width of the design to accommodate wearing a wedding ring and engagement ring at the same time. You can also mix and match style elements in order to accommodate a common motif. For example, our Flores collection can have basically anything you desire. One distinct advantage with working with a designer studio is that you can vary the widths, and create custom wedding rings to match your desires. Our two tone Celtic Link Wedding Ring. The best precious metal choice for a two tone wedding ring can be a complicated decision. You are not just choosing one precious metal, but two. Among metals with natural color other than white, yellow gold is the choice. Rose and white gold are yellow gold colored with alloys. The natural white precious metals for wedding rings include silver, palladium, and platinum. Among the natural white metals and white gold, there are distinct advantages and disadvantages of a two tone wedding ring, based upon hardness, cost, and the actual whiteness of the metal. Since it is possible to combine any of these metals, I’ll explain the options—starting with gold—then offer my opinion as to which the best choices are. When jewelers discuss gold wedding rings, they speak in terms of “karat.” The word "karat" is a variation of the word "carat," which originated in ancient Greece, where carob seeds—which are rather consistent in weight—were used as a unit of measurement. "Carat" has become a unit of weight in the measurement of precious gemstones, while "karat" now refers to the percentage of gold in jewelry. Twenty-four karat (24K) is .999 pure gold. An 18K wedding ring would be 75% gold, while a 14K gold wedding band would be 58.5% gold. The balance is various alloys, which we will discuss below. Though this information might be familiar to you, really understanding can be very helpful. Jewelers will almost always recommend 18K gold because it is more profitable for them. After reading this next part you will see clearly why, with white gold, we recommend 14K for two tone wedding bands, while with yellow gold, we recommend 18K. With rose gold, you can go either 14K or 18K, depending upon your color tone preference. Ultimately, our recommendation of whether to choose 14K or 18K gold for your two tone wedding rings or two tone engagement rings depends upon your color and color tone choice. If you want yellow gold in your two tone wedding ring, we recommend 18K. Gold already has an illustrious beauty and warmth, and an 18K gold ring has that much more gold and therefore a stronger gold feeling and color, which would make more of a statement for your ring. If you are considering rose gold for your two tone wedding ring, then the choice is a matter of partiality. An 18K rose gold is going to be a bit lighter in color than a 14K rose gold ring, which has more copper alloy in it. If you want a stronger rose color, go with the 14K. Again, it will be less expensive, more “rosey,” and harder. If you want white gold in your two tone wedding ring, then we’d suggest going with 14K again. A 14K gold ring has more alloy in it, and therefore is going to be whiter. Two other advantages to going 14K white gold over 18K white gold for two tone wedding bands: the lower karat is less expensive and more durable. Gold in itself is a very soft metal and the more it is alloyed the harder it becomes. But, how does white gold compare to silver, palladium, and platinum in two tone wedding bands? 10. How White is Your White Metal in Your Two Tone Wedding Ring? Let’s start first with this issue of “whiteness.” The graph above was developed by Gretag Munsel from a color spectrophotometer to address this question. As you can see, the whitest metals are the natural white metals. Platinum and palladium are comparable. Silver is slightly whiter than platinum. White gold, however, has a broader range of whiteness, from white to more of a beige color. But the most relevant question here is, is the white in the white gold white enough? In fifteen years of selling white gold wedding rings online to people who could not actually see them in person we have never had a ring returned for not being white enough. Nevertheless, to create a white gold wedding ring that looks like a platinum wedding ring, jewelers came up with rhodium plating. Rhodium is a natural white metal in the platinum family of metals. Plating is controversial, as shown in this article I posted several years ago. We do not recommend this process because rings have to be re-plated every few years. Wedding rings should be enduring and not require maintenance like a car or vacuum cleaner. These days, white metal rings are the most popular choice and we sell more white gold than yellow gold wedding rings. Most two tone wedding rings are a combination of white metals and yellow gold. Until 15 years ago, white gold was the affordable alternative to platinum. These days, palladium wedding rings are gaining popularity. Palladium is a naturally occurring white metal that is lighter in weight than platinum, but just as white and the same price as 14K gold. Silver is also an excellent choice for a two tone wedding ring. A two tone gold and silver wedding ring is going to be less expensive, and is especially appealing to those who like to wear gold and silver jewelry at the same time, or interchangeably. In terms of whiteness, I don’t feel it is enough of an issue to sway a decision in any serious way. The deciding factor often comes down to budget and personal preference. If you want more information on this issue of white metals and wedding rings, take a look at this in depth companion article I’ve written: White Metal Wedding Rings: 11 Points To Know Before Your Purchase. 12. Who Are The Makers? Many jewelers won’t even raise this subject of how a ring or piece of jewelry is made, but we do feel that it is important to consider. American manufacturing means American jobs. The maker’s movement is an important cultural phenomenon in America today. Wedding rings are intimate and personal possessions. For some, the only consideration is price. Understandable...but given that the wedding ring is the one piece of jewelry that couples wear all the time, a little flexibility might be a good idea. Should not the wedding ring reflect the uniqueness of the relationship itself? 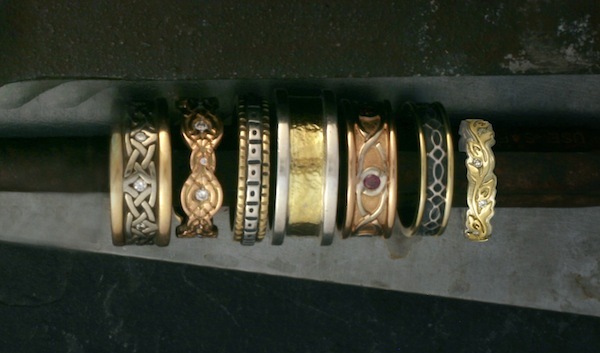 Essentially, the choice comes down to rings that are mass-produced versus those that are studio made. In this case, you may want a piece that is made with love by a skilled artisan who has dedicated his or her lives to a perfect a craft. The choice is simple work with a small jewelry studio. The jewelers who work in our shop have spent decades perfecting their craft. They love what they do, and that skill and pride goes into the making of the ring. For chain jewelry stores and their mass-market websites, where the primary consideration is price, mass production is the rule of thumb. Though a two tone wedding ring has great symbolic meaning to you and your partner, to the seller it is purely a commodity, most likely made in China. The conditions under which it was made and who made it are of little consequence. Sad, but very true. The primary method of making such rings is usually through CAD/CAM or die striking. With the CAD/CAM process, components of a ring are drawn up on a computer screen, sent to a wax-modeling machine, and then reproduced in a repetitive casting process. With die striking, one piece of steel “strikes” another piece in order to form, with 50 tons of pressure, wedding bands. While the material may be different, the soulless, efficient manufacturing processes in making these two tone wedding rings is not that different from how you might create the pots and pans sold at a discount store. Our Felicity two tone wedding ring is one of our handmade rings. Between gold, pure flame, and dedicated artistry, there is a special alchemy. You can choose to have a handmade two tone wedding ring made by someone who has dedicated a lifetime to achieve a high level of mastery. The patience and craft it takes to have a beautiful and enduring partnership can truly be reflected in the actual creation of the ring itself, which is a kind of offering of sorts from the artisan jeweler to the couple. Although entirely handmade, these rings need not be overly expensive, especially working with gold and silver. This two tone Flores Design, a lovely gold over silver two tone wedding ring, sells for just $425. The above two tone ring is made entirely by hand, fabricated with sheet metal, wire and design elements. The technique is hundreds of years old, a modern day extension of a traditional jewelry techniques that were originally brought over from the Spanish Conquistadors who settled in the American Southwest over five hundred years ago. But, the final consideration is—where did that gold and silver come from? 15. Where Does The Metal Come From? Precious metal can be sourced on the open market, it can be from recycled sources, or it can be from fair trade sources. Many people concerned about the impact of mining prefer to purchase from jewelers who use “eco-friendly” recycled metals. Certainly, using 100% recycled gold to make wedding bands is better than utilizing gold from massive industrial mining operations. Using recycled precious metal does not prevent the ruining of our ecosystems from mining, child labor, or the heavy use of mercury. In fact, it avoids these critical issues completely by making the supply house the source of where the metal comes from. Here’s the deal: Large-scale mining is about the politics of greed, while small-scale mining is about the politics of bread. About 15 million small-scale miners produce about 15% of the world’s gold supply, yet they make up 90% of gold mining labor. Their lives are characterized by extreme poverty and exploitation. 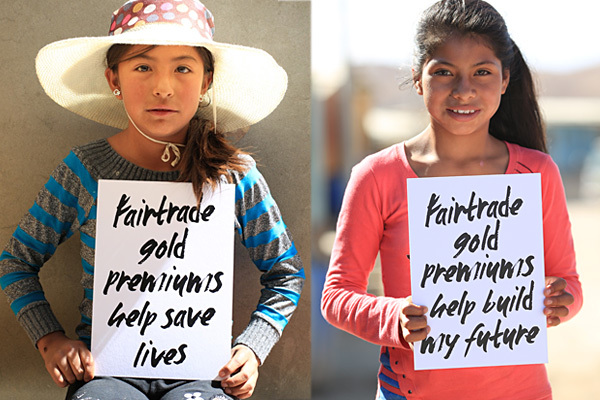 We can help them by purchasing a wedding ring made of Fairtrade Gold. Fairtrade Gold is the best opportunity that these miners have to work their way out of distress and into a better life. It’s backed by Fairtrade Gold certification, an independently audited set of benchmarks created by Fairtrade International. If you still are not sure about Fairtrade Gold versus recycled gold, read this article I wrote: 15 Reasons Why You Should Buy Fair Trade Gold Jewelry Over Recycled Jewelry. In choosing to make your two tone wedding ring out of Fairtrade Gold, you have assurance that the environment was not polluted with mercury and that the miners themselves were paid an authentic price for the value of their gold. If you really wish to have a two tone wedding ring that even in its making reflects the more beautiful world you wish to see, then the best choice is simply Fairtrade Gold. I have a two-toned wedding ring, and love the mix of metals! Mine is white gold and yellow gold... bought it over 15 years ago, when Fair Trade was not an option, though. So glad folks have that option now. Hi Jade, Thanks for your comment! Two tone rings in Fairtrade gold are even now relatively rare because they have to be hand fabricated. Thanks for your kind words about our efforts. My parents have two tone gold wedding rings. I really like the look, and the versatility to wear both white metals and yellow metals with the wedding ring since you will be wearing it every day. That's the great thing about two tone bands-- that versatility. So, if you wear silver/white and yellow gold, you can match the colors with t he two tone bands. This is definitely the best article I have found so far: but it doesn't answer all my questions: so maybe you can help and add some info. Most of the rings I see here have both metals encircling the whole shank. Is it possible to make a two tone ring that is all one color on one half and the other color on the other half? (this would be a no stone or burnish set tiny stone scenario) How well do the metals stay together? Say if I wanted to wear a palladium ring some of the time and then be able to turn the band around on my finger and wear an 18K gold ring some of the time, would that work? Thanks! Carole, I think one of the issue might be that the band is so thin it is hard to distinguish the colors. But, I guess I need more info. Is this a problem that you had from the start or a problem that you had after wearing the ring for some time? I wonder if having it professionally cleaned might bring out the difference a bit? A jeweler would need to take it to a polishing wheel.... Just trying to brainstorm here.